This product does not support Dolby Digital 5.1ch. For purchasing Capty MPEG Edit EX capable with Sony HDD camcorders (Capty MPEG Edit EX Dolby Digital 5.1), please click here. None-image deterioration for MEPG-2 movies! This software enables you to trim movie by frames, as well as by GOPs. Divide a movie into several files by selecting multiple ranges. Encode the edited file to QickTime format. Supports MPEG Elementary Stream format. Combine multiple MPEG-2 files into a single MPEG-2 file. In the "Trimming mode", you can import a single video footage and pick up necessary parts from it, or divide it into several files. When editing long videos, you can apply only the required range from the entire time in order to perform detailed operation of the specified position on the Play Slider. * Selected frames can be viewed in thumbnails. You can easily set IN point and OUT point by dragging and dropping. 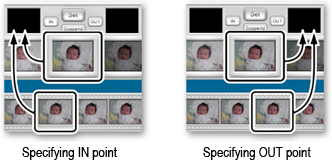 Click [Set] and the specified range is displayed in the Trimming List. File combination mode enables users to combine multiple movie files into a single new file. Simply click [Add] button to add video files to [File Combination] window. * You can also add video files by dragging and dropping to [File Combination] window. * MPEG(system stream)format : Encode to one video file. It can be used for PIXELA's "Capty DVD/VCD Ver.2". * MPEG(elementary stream)format : Separate files to video data and audio data. It can be used for Apple's "DVD Studio Pro". * DV Stream format : Encode as a DV Stream. 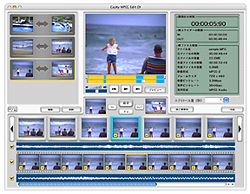 It can be used as a content for Apple's "iMovie". ** It may not be converted depending on a version of QuickTime or component. "Dolby" and the double-D symbol are trademarks of Dolby Laboratories.